The latest American massacre-in-a-gun-free-zone happened last night in Chicago. Gun control failed to protect 13 from being killed in a drive-by shooting in Cornell Square Park. Indeed, gun control is what guaranteed that any law abiding citizens would be unarmed and therefore easy targets. This doesn't generally happen in "shall issue" concealed weapons carry jurisdictions, because there the targets can shoot back. There are no other incidents of mass violence in the headlines, and our overlords in DC haven't passed any sweeping new controls on the American tax-slaves. So, as it was two days ago, we're looking for a Bloodbath Formula in the sky, but a weak one. 1. Pallas (the libertarian non-aggression principle) is square the Nodes, as she will be for the next two weeks. Ethics, particularly involving aggression/non-aggression, are in the spotlight. Pallas' ruler the Sun is (weakly) mundane-square Pluto, and Pluto is stationing making him quite strong. 2. Venus is weakly trine Neptune, softening the natural respect for property rights. One's property includes one's body -- the body is not something one is but something one possesses. The North Node may partially mitigate this, but for the charts of transient events (and non persistent entities) I often can ignore the Nodes for this calculation. 3. Venus ruled by and sextile Pluto. Destruction of property, including bodies. 4. The Moon is square Pluto. 5. 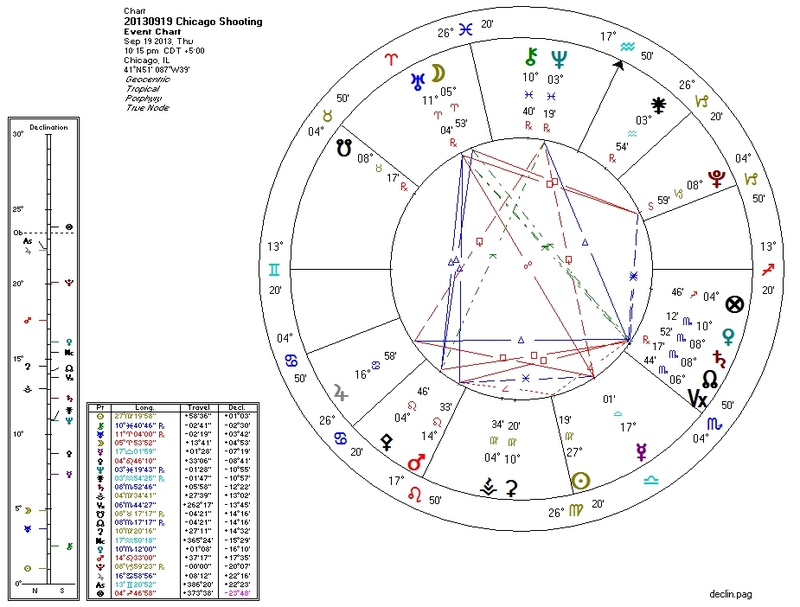 The Sun, widely mundane-square stationing Pluto. It can't be said enough times. Gun-control zones provide killers with easy targets who can't shoot back. Gun-control advocates are not your friends. Quite to the contrary, they enable the killers, who always manage to obtain guns.